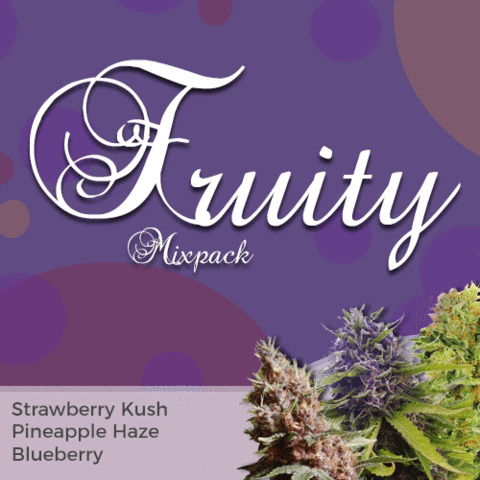 The Fruity Mix Pack contains three, individually packaged fruity flavored Marijuana strains combining to total 9, 15, or 30 seeds in each pack. 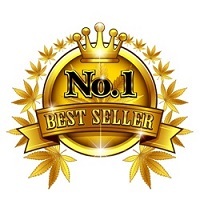 Strawberry Kush, Blueberry and Pineapple Haze, three highly popular strains, all feminized guaranteeing a top quality female plant. Germinated together the plants will require between 64 - 68 days to completely flower and mature, producing good yields of aromatic, fruit flavored Marijuana buds. A great way to grow a selection of complimentary strains. Find out more about Fruity Mix Pack Seeds. Strawberry Kush: A compact, Indica dominant strain, easy to grow with impressive yields. Very short flowering time produces dense, compact buds with a fruity, berry flavour. Produces a euphoric high and relaxing body stone effect, perfect for both day and night-time use. Pineapple Haze: Tall, Sativa dominant plant with a longer flowering period produces heavy-weight, hard-hitting buds with a sweet, fruity Haze flavour and subtle aroma. Very cerebral, euphoric high that can be energising and creative, great day-time smoke. Blueberry: Very tasty, fruity Cannabis with a blueberry taste and long-lasting flavour. Average flowering times produce good yields of dense, swollen buds. The even blend of Sativa and Indica genetics produce a powerful high andstrong body stone that leaves you feeling calm and relaxed. Read the complete Fruity Mix Pack Review. Buy Fruity Mix Pack Seeds today and receive free worldwide shipping guaranteed. Pineapple Haze The legendary Pineapple with a Bergman twist to it. The smoke will leave you very uplifted and energetic with a ‘ever so slight’ body buzz. BlueberryThe Blueberry marijuana plant offers a very fruity blueberry taste and euphoric high that will last quite a while.